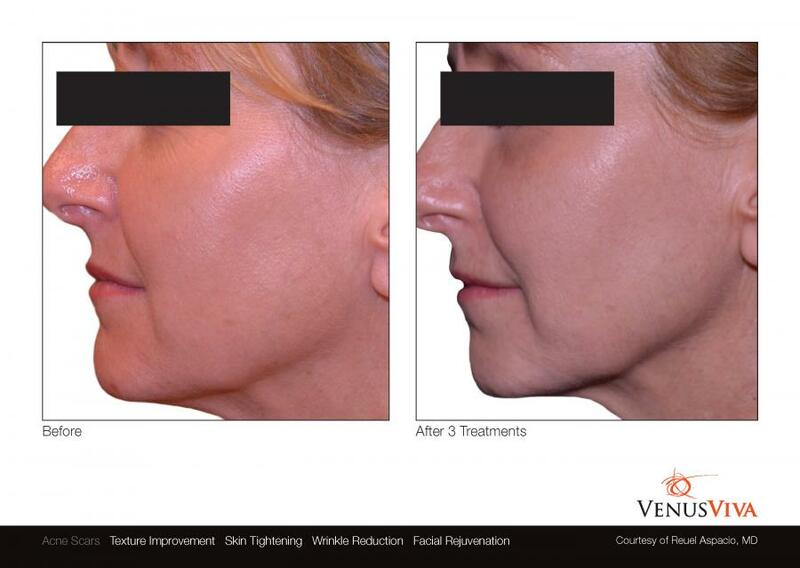 The latest beauty innovation for facial resurfacing and remodelling - the Venus Viva! Smooth and diminish fine lines for firmer, younger looking skin. Soften and decrease visible pores for even texture. 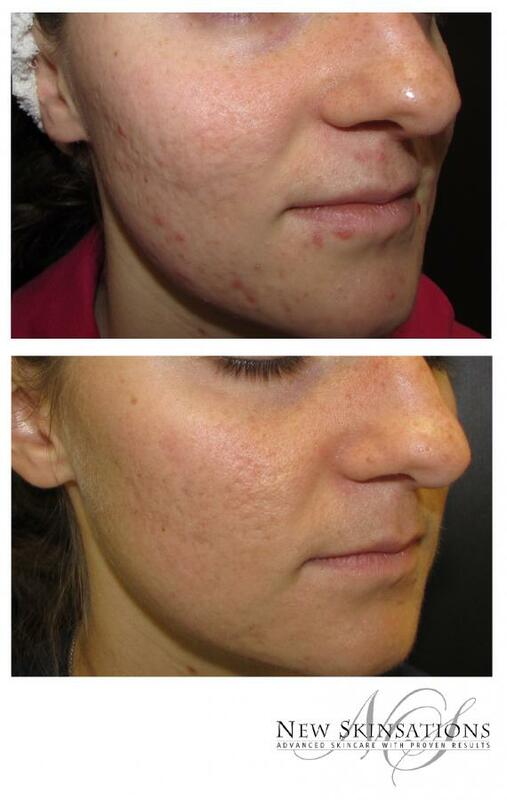 Significantly reduce deep acne scarring. Clear and refine blemishes for a healthier looking complexion. 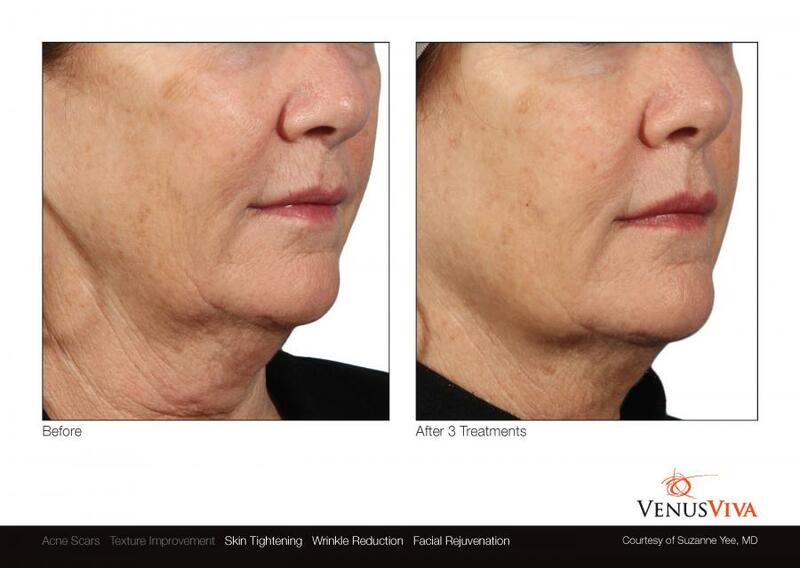 Even rejuvenate and reduce neck lines for a refreshed and more youthful appearance. 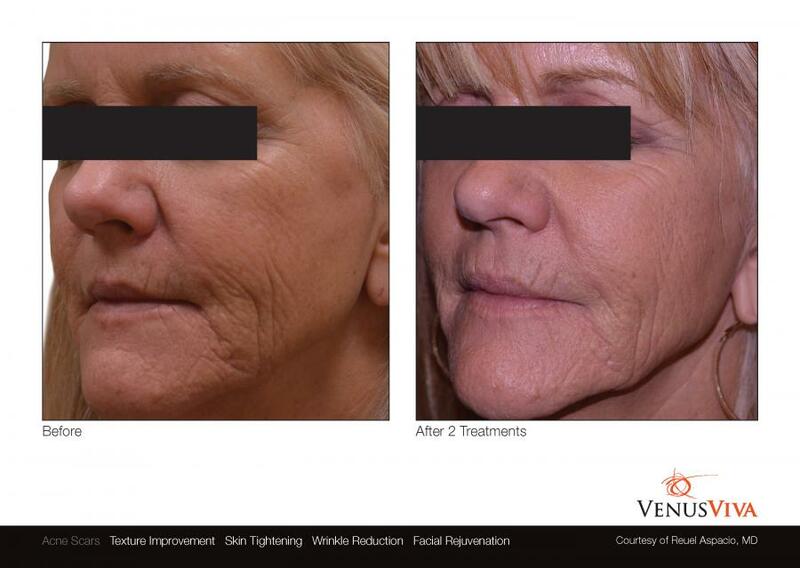 The Venus Viva is non-invasive and operates using revolutionary technology to safely improve skin texture and tone, fine lines and wrinkles, and acne scarring. 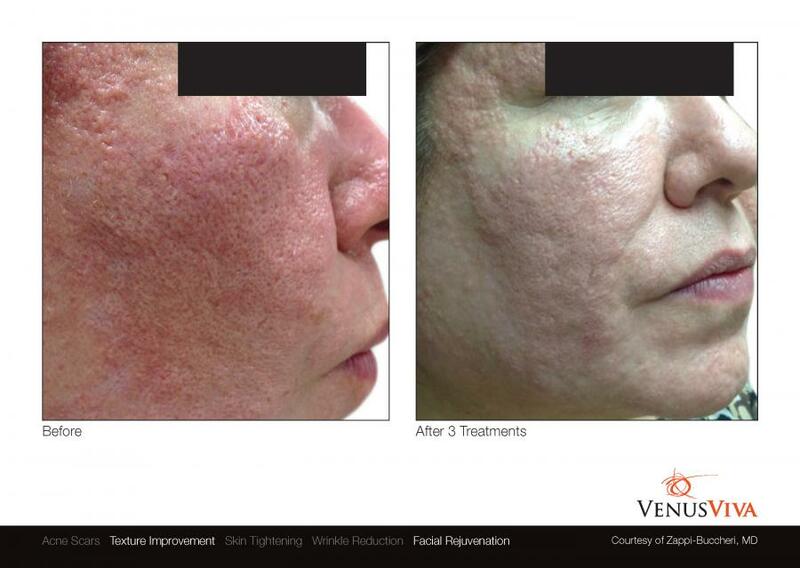 If you are considering laser resurfacing or microneedling, consider the Venus Viva. 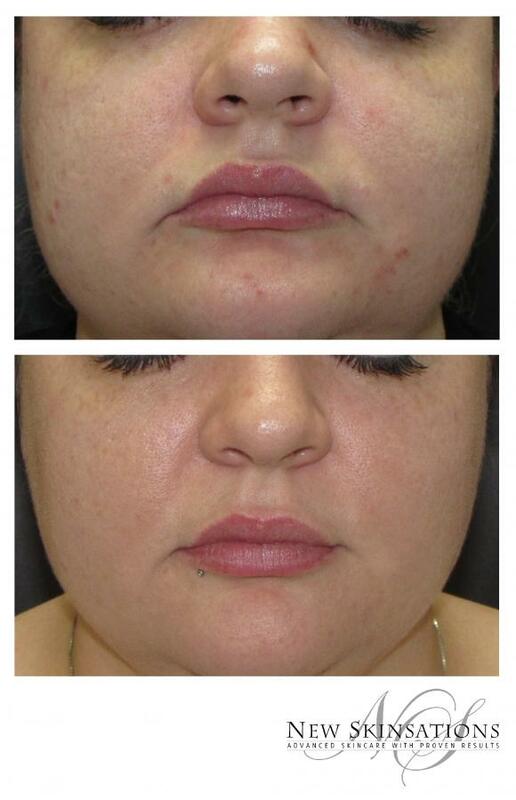 Truly amazing results with minimal downtime and suitable for all skin types! The Venus Viva is suitable for all skin types! This treatment is ideal for clients who wish to reduce signs of aging such as fine lines and wrinkles, and improve skin texture with regard to visible pores and acne scarring. Treatments can be customized to optimally address your primary concerns. The neck and decollete can be treated in addition to the face. We highly recommend a complimentary consultation if you are interested in Venus Viva treatments so that we can answer any questions you may have and provide realistic expectations for you personally. During the consultation, our trained professionals will evaluate area to be treated, discuss the treatment process, and establish a treatment schedule and cost. All of which will make you much more comfortable when you come in for your first treatment. 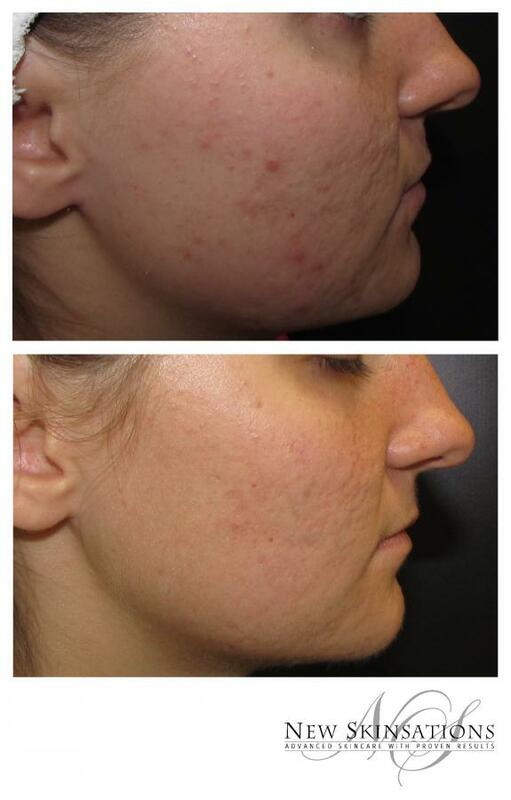 Many of our clients notice smoother, clearer and younger looking skin after their first treatment, but full results are typically seen after a series of three treatments are performed. In general, long-term collagen stimulation and regeneration for lasting results can be achieved in approximately 2-3 treatments. 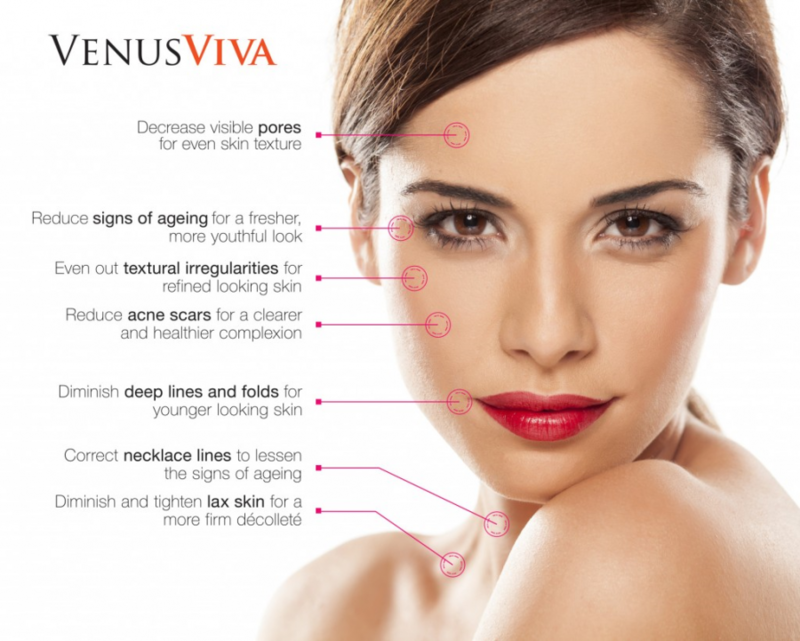 Venus Viva treatment benefits: tightens lax skin, evens out skin tone and texture, diminishes visible pores and the appearance of Rosacea, controls pigmentation, reduces and softens appearance of fine lines and deep wrinkles, decreases visible signs of acne scarring, elevates and resurfaces the delicate skin around the eyes. Results build with additional treatments and time; don't be alarmed if you do not see immediate results after only one treatment. 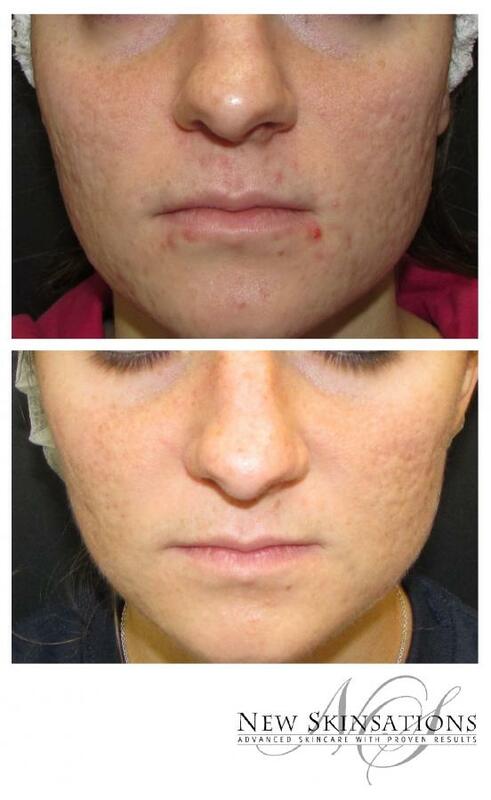 Skin regeneration and remodeling takes time. It may take several weeks to see the full effects of your results after completing the last treatment of your treatment series. Results may vary from person to person because each of our physical attributes, skin or health conditions, lifestyles, and/or personal goals are unique. These factors can also impact to what degree and how soon you will see results. 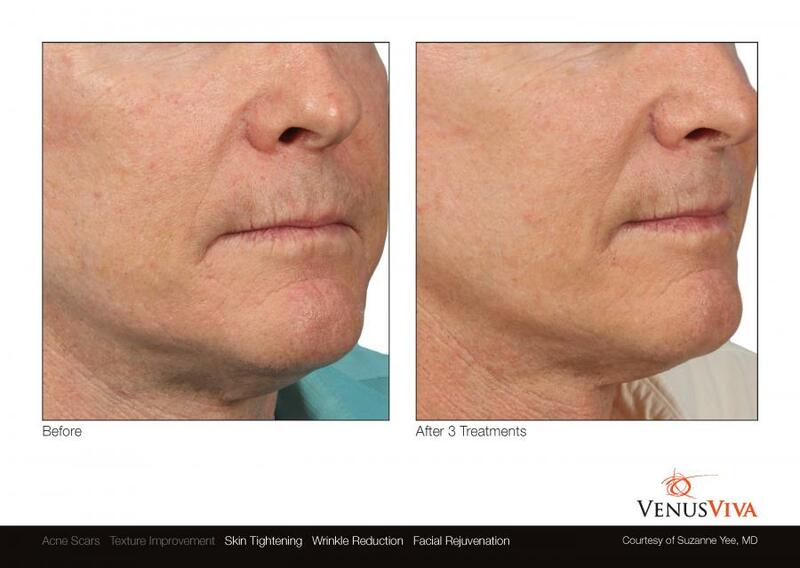 The Venus Viva is a revolutionary, fully customizable solution for facial resurfacing. Treatment settings can be customized to optimally address your primary concerns and deliver superior results. The Venus Viva uses NanoFractional Radio Frequency (RF) and SmartScan technology to deliver energy deep into the dermis to generate heat and initiate changes within the skin to stimulate collagen remodeling and cause the tissue to regenerate to produce fresher, younger looking skin. The unique SmartScan feature enables a selectional application of a dermal heating process so that the energy is not delivered all at one time and ensures optimal energy is delivered throughout the treatment session. This feature enhances patient comfort during treatment and minimizes downtime in comparison with other treatments. The Venus Viva applicator is applied to clean skin. With each pulse, energy is delivered deep into the skin through a unique pin pattern. Application of the energy causes a stimulation of fibroblasts and promotes the synthesis of new collagen. New collagen fibers are built creating a tighter, more compact skin matrix. In other words, the energy triggers the body's natural healing process and foces skin cells to produce new collagen, which leads to a smother, healtheir complexion. Because this treatment results in ablated zones that are surrounded by healthy tissue, downtime is significantly less than with other ablative treatments. 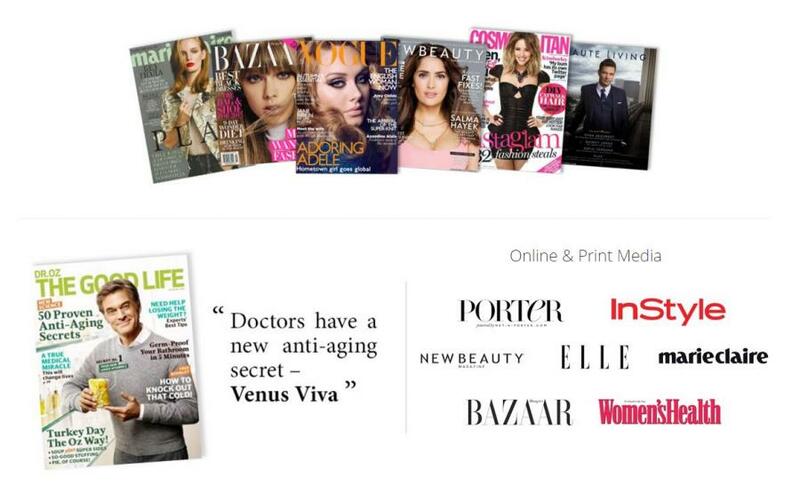 What makes the Venus Viva a revolutionary innovation in the medical aesthetics industry? The Venus Viva is the only non-invasive RF system that allows the operator to customize the intensity of the treatment to meet the needs and personal preferences of the patient. 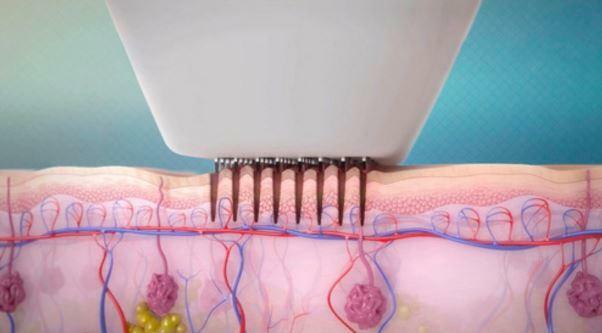 Patented tip technology promotes a faster healing process by creating tiny micro dermal wounds, which expedites the coagulation process compared to other traditional fractional treatments. 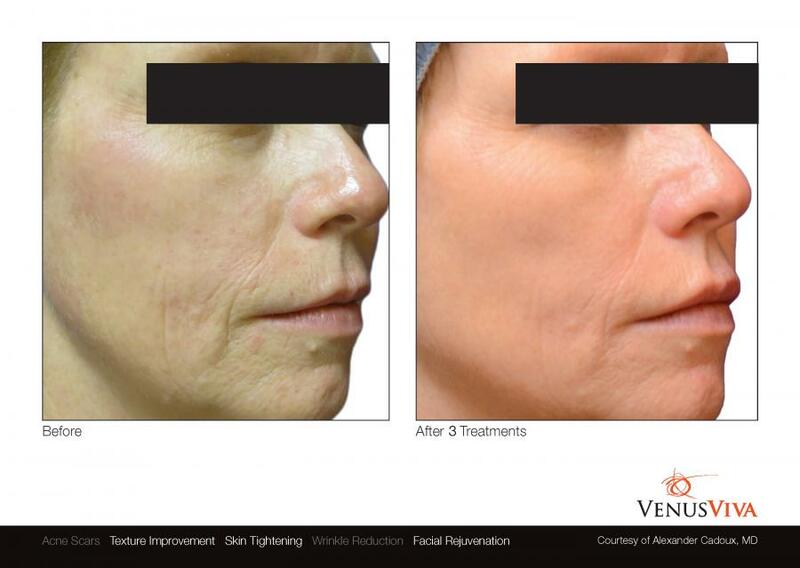 With the ability to penetrate deeper, control coagulation and ablation, provide consistent and comfortable selectional dermal heating, there is no comparison to other resurfacing procedures. All in all, the Venus Viva offers treatments that are safer, faster, more effective, and less complex, with significantly less downtime and patient discomfort. There is minimal downtime and maintenance with this treatment! Downtime can last less than 24 hours. You can return to most regular activities immediately after treatment. You may experience a little redness, which typically lasts 2-5 days, but makeup may be applied the day after treatment. It is extremely important to wear a sunscreen of SPF30 or higher daily post-treatment. Wear a hat or reapply if you will be spending any time in the sun. Continuing to wear sunscreen daily is one of the best precautions you can take to prevent future damage as well. Following the final treatment of your initial series, maintenance treatments can be done as needed. Skin Resurfacing treatment schedules are customizable and will vary depending on your personal preferences and goals, as well as treatment intensity. Based on your needs, we can design a treatment schedule that works for you personally. The number of treatments needed will vary from person to person, but typically a series of 3 treatments is recommended. Treatments are scheduled at least 4 weeks apart. Schedule a free consultation to learn more and establish your personalized treatment schedule! Treatment costs will vary depending on the treatment area(s) and the number of treatments needed. We highly recommend a personalized consultation with one of our trained professionals free of charge to ask questions, discuss the treatment process, and to establish how much your treatment will cost. We do our very best to be competitive and make treatments affordable for our clients. Pay as you go or take advantage of our package pricing by prepaying for your treatment series! 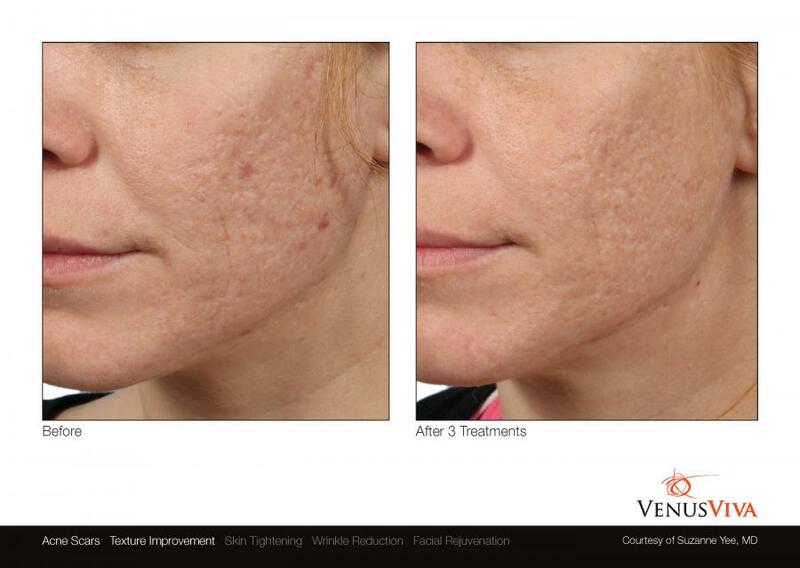 Venus Viva treatments are absolutely safe! 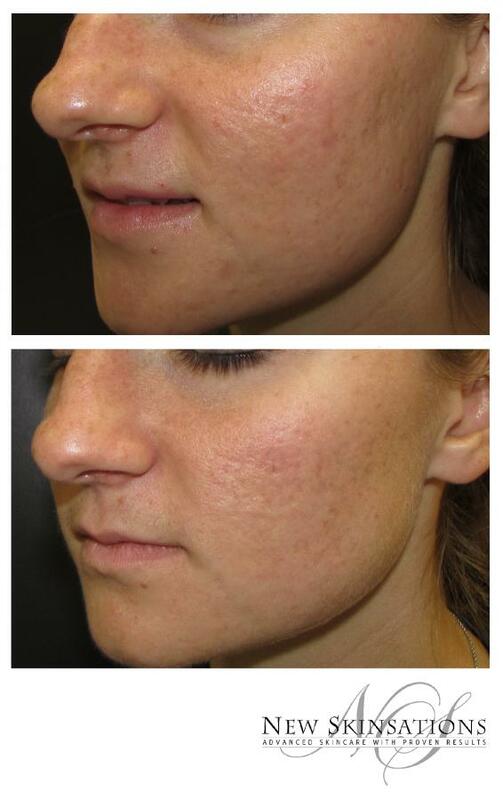 Our skin care professionals are highly skilled and professionally trained to perform this procedure. This non-invasive procedure has been approved by the FDA to treat textural irregularities, fine lines and wrinkles, and acne scarring. 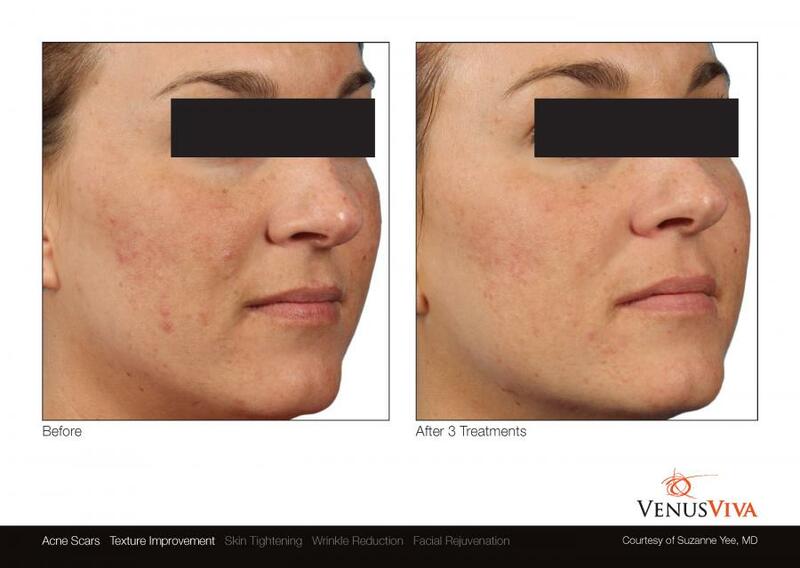 Clinical trials showed that Venus Viva treatments can also improve skin tone and by fading unwanted superficial pigmentation. Radio frequency has been used for many years in medicine and is a proven, safe technology in medical aesthetics. The Venus Viva's SmartScan technology enhances patient safety and comfort via selectional dermal heating.